Commonly known as gum disease, Periodontal disease is one of the most common diseases in humans. As the name sounds, “Perio” means around and “dontal” means tooth. It is like an infection on the area around the teeth which include gums, periodontal ligament, and alveolar bone. 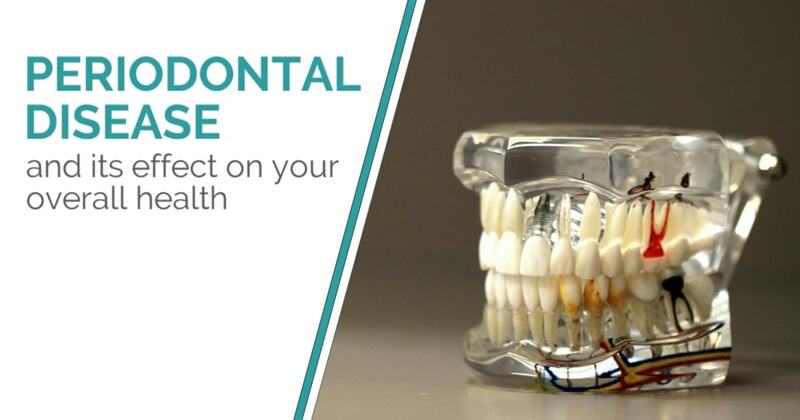 If not treated timely, it may destroy the support of your teeth i.e., your gums. Your gums being the supporting tissue can be affected and irritated. Periodontal disease is one of the primary causes of tooth loss among adults thereby resulting in poor diabetes control. ● One of the early symptoms you can experience is bleeding while brushing or flossing, red, swollen or sensitive gums. This itself illustrates that the gums have been infected by the bacteria. ● Avoiding this infection at the early stage can expand or destroy the roots that are a pillar for your jawbone and teeth. ● Eventually, as your teeth become loose, it can be extracted easily. ● You may also experience other symptoms such as gums splitting away from the teeth, bad breath, change in the way your teeth fit together when you bite, ulcer in your mouth, etc. In many instances, it has been observed that periodontal disease begins with plaque a sticky white element that layers the teeth after a few hours of brushing. To get rid of the bacteria or germs, the cells of your immune system release substances that stimulate and destroy the gums, periodontal ligament or alveolar bone. If the plaque left untreated, it can stiffen beneath your gum line into tartar. As soon as tartar is build up, it is more difficult to remove and is filled with bacteria which can only be removed by professional dentists through cleaning. Over a time it causes gingivitis. It is inflammation of the part of your gum nearby the base of your teeth. However, dentists can reverse gingivitis in the early stage under professional treatment and good oral care. Furthermore, Periodontal disease does not only affect your dental health, but it also has a great impact on several other problems related to your health including diabetes, heart disease, dementia, premature birth, rheumatoid arthritis, cancer, respiratory disease, etc. A diabetics person have a greater risk of developing gum disease as compared to people who have healthy blood sugars. On the other way around, research has also suggested that it become more difficult to control your blood sugar levels when you have severe gum infections. Having an infection may contribute to increasing the blood sugar level. In addition to that, diabetes not only reduces the body’s resistance to infection but will increase your gum diseases which may make diabetes harder to control. Throughout the years, several studies have found that gum disease may cause poor heart health, including heart attacks. Inflammation is the root cause and the main thing that cause damage to blood vessels. The bacteria which infects the gums can also travel in your blood vessel and can go anywhere throughout the body which will cause inflammation and damage resulting in tiny blood clots, heart attack, and stroke. Some research also suggests that if your carotid arteries become too thick, your blood will unable to flow to your brain thereby resulting in a stroke. ● Maintain good oral hygiene- Brush your teeth at least twice daily, in the morning and before going to bed. Don’t forget to floss daily as flossing will help you in getting rid of loosened food particles and bacteria. ● Regular dental visits- Visit your dentists for regular cleaning which will help to remove increased tartar and other gum diseases. ● Eat a healthy diet- Prefer having a healthy and well-balanced diet. Avoid eating starchy and sugary foods which will increase plaque. ● Say no to tobacco and cigarettes- Smoking and consuming tobacco can lead to gum disease and oral cancer.